Narraguagus' Madison Leighton, right, has the ball knocked away by Calais' Olivia Huckins during Tuesday morning's Class C North quarterfinal. The Calais High School girls basketball team has made a successful transition to a new coach this season. After serving for several years as an assistant coach for the Blue Devils, then taking last season off to watch his daughter Sophie play for Calais, Bill McVicar pursued the head coaching job when Arnie Clark retired. Clark died in August at age 73 after a period of declining health. With one game remaining in the regular season, Calais has yet to lose under its new coach. The Blue Devils are 17-0 and the only unbeaten in the 20-team Class C North. That said, McVicar knows that 14 of the Blue Devils’ wins have come against teams with losing records and a combined mark of 26-89. Calais’ average winning margin is 35.6 points (69.4-33.8), so it may not be as battle tested at it would like heading into the Class C North tournament. “That’s a concern. There have been some games that have been a little more lopsided than we would have liked. But we just play the schedule we have,” McVicar said. The Blue Devils own victories over Woodland, which finished the regular season 13-5 in Class D North, and a season-opening 57-42 road win over Narraguagus High School of Harrington (16-1). 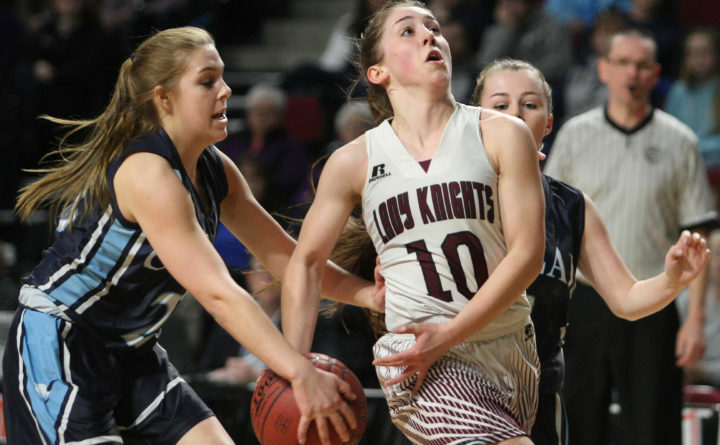 Calais was scheduled to host Narraguagus on Wednesday night in the season finale, and the game was expected to decide whether Calais finishes second in the Heal Point standings to earn a first-round bye and advance to the quarterfinals at the Cross Insurance Center in Bangor. Only the top two teams earn a the bye, and 15-3 Central Aroostook of Mars Hill appears to have the first spot locked up. Madawaska and Dexter are neck-and-neck with Calais and Penobscot Valley of Howland for the No. 2 spot. PVHS (13-4) had one game left against winless Lee Academy, while Calais, Madawaska and Dexter each had games that were more pointworthy. McVicar said being a head coach for the first time required an adjustment. “Things are certainly a little more challenging, but it’s been good,” McVicar said. “Hopefully, the transition has been OK for them. We’re learning how each other communicates. The Blue Devils went 15-6 a year ago and earned the 11th seed. They upset No. 6 Central Aroostook (54-42) in a prelim and No. 3 Narraguagus (53-49) in the quarterfinals before losing to No. 2 Dexter (36-15) in the semis. Calais features the guard trio of senior Lauren Cook, senior Olivia Huckins and sophomore McVicar. Cook, who earlier this season eclipsed the 1,000-point mark for her career, is averaging 18-19 points per game. Huckins and McVicar contribute 12-13 points per game each, their coach said. Junior forward Libby Bitar is another returning starter who uses her 5-foot-9 frame to grab rebounds. Sage Phillips, a 5-9 freshman, has been been a big help on the boards, and 5-9 freshman Alexis Donahue has added rebounding depth. Sophomore forward Nedra Bassett has been a high-energy player with an exceptional work rate and with McVicar is an effective rebounder. Freshman guard Trinity Jones contributes off the bench. The Blue Devils will be a dangerous team in the postseason because of their ability to shoot the basketball. McVicar helped coach Class C state championship teams an an assistant in 2010 and 2014 when he was coaching his daughters Alex and Maddy, respectively. Maddy is the backup point guard at the University of Maine. He would love to make it three with Sophie.